Cancellation with NO FEE can be made via e-mail directely to the Hostel reception or trough HW within 3 days ( 72 hours ) prior arrival. After this mentioned time Hostel Mancini will have the rigfht to charge the 50% of the balance due to the provided guest credit card. PLEASE NOTE that we DO NOT accept any cancellation by phone!! Hostel Mancini is in a convenient spot just five minutes' walk from Napoli Centrale train station as well as the metro, on the edge of the historic centre. It's also surrounded by interesting daytime markets. This hostel offers a free breakfast and is most frequently praised for the excellent staff who are 'very friendly and helpful and give you a detailed introduction to Napoli and around', according to one Hostelworld visitor. Small, Clean and Safe, Hostel Mancini, is Napoli most central backpacker Hostel that provides: free breakfast, free wi-fi and also has a fully loaded kitchen. The property offer several kinds of accommodation to meet your needs. Ideal for solo travelers as for families, students and groups of friends. Located right in front of Naples Central Train Station with access to local Circumvesuviana trains to Pompeii, Mt. Vesuvius, Sorrento and Herculaneum. A great location for Erasmus students, since it is located at 5 minutes from Naples’ two main Universities, Federico II and l'Orientale. The most famous Pizzeria da Michele is right at 3 blocks from the Hostel. 10 minutes by walk is the port of Naples with ferry service to many local islands such as Capri, Ischia and Procida; as well as other destinations throughout Italy. Football fans can also call in advance to purchase tickets to watch S.C.C. Napoli play live at the historic San Paolo Stadium! Tickets can be made available for pickup at the hostel on game day! Our friendly multilingual staff ( English, Italian, Spanish, Portuguese, Polish and German ) are always willing to answer your questions and provide you with useful information about local travel destinations, cheap local restaurants and other places of interest in Napoli. We provide all guests with a free city map to show how easy is to reach the most important touristic attractions in the city. Allow us to guide you through worry free and affordable day trips in Napoli and surrounding areas. 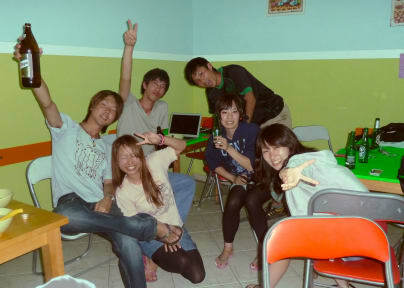 - Guests can return to the hostel at any time as here we have no curfew! We make every effort to accommodate you in the dormitory size of your choice. However, because of the nature of our business, we may have to place you in a different dormitory ONLY in case the dorm is previously booked by a group. Excellent Hostel very close to train station . Helpful Staff and lovely breakfast . Clean safe welcoming highly recommend it . Bring ear plugs as outside street noise at night is loud at times . Very nice hostel. Next to train station. Walking distance to Da Michale pizzeria. Good breakfast. Enjoyed the stay and highly recommended. This hostel was in a great location, right by the train and next to some of the best pizza spots in Naples. The staff was fun, friendly, and helpful with anything we needed. They also keep the place sparkling clean and have amazing showers. It was lovely having breakfast included as well because it really helped to kick start the day. I enjoyed it so much I have already gone back to stay a second time, and I would definitely stay here again. This hostel is a very nice and calm base to explore Naples. The staff was friendly, the breakfast was good, and fellow travelers chatted and shared experiences. Really nice staff, clean facilities, no bed bugs which is always nice 😆 but seriously though, very clean. Location is great, close to the station and old town. The area outside looks a bit dodgy but I never felt unsafe. I wandered around Naples by myself day and night and never had a problem. Breakfast is basic but good to start the day with! Location was close to the train station and staff were friendly. We were upgraded to a private room with an en-suite and would recommend it to anyone. Felt very unsafe on the street in front of the hostel and had a lot of problems finding the hostel itself. The staff was friendly but passive aggressive and tried to tell us we could not eat in our private room as if we were 5 years old. Overall would not recommend visiting due to the scary environment in front of the hostel. Unfriendly staff, old facilities that hardly work (like a leaky drippy shower), and I left with BED BUG BITES on my left arm. I suggest against it. I think our most unique feature is the array of bright colors in the hostel - it presents guests immediately with a happy and friendly atmosphere. The historical city center is just a few blocks away and boasts such sites as the Duomo, the National Archeological Museum, the entrance to the ancient Roman and Greek aqueducts, three Spanish castles, and OF COURSE Naples\' most famous pizzeria, Da Michele just around the Hostel corner. I particularly recommend to visit the Bay of Naples with Castel dell'Ovo and Piazza Plebiscito, which are beautiful and lively day and night. You can also join our FREE walking tours. Our average age group is 20-30, but we often have many families who choose to stay with us.